The word tomme implies that a cheese is made from the milk of more than one herd. 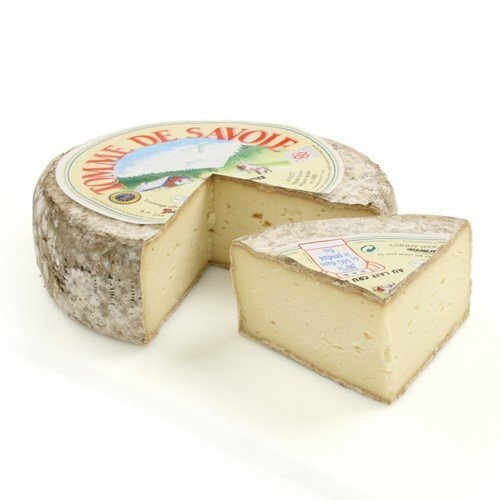 Tomme de Savoie is made by an expert cheesemaker and is always of exceptional quality. It has a beautifully rustic, gray-brown, fuzzy, inedible, thick rind. The cheese inside is robust with slight overtones of salt and an unmistakably raw flavor. This French, unpasteurized cow's milk cheese has a charming simplicity. It is absolutely wonderful paired with sausages, fruit, bread, and wine. All the good things in life! Made from unpasteurized cow's milk; aged for 60 days. Photo depicts whole 4 lb. form of cheese.